First introduced in 1961, the DB4 Convertible reflected the then current DB4 Saloon series four, using the same six cylinder, 3670cc engine now producing 260bhp. 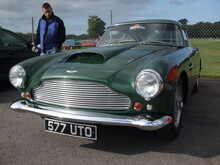 Some 32 DB4 Convertibles were built with Vantage specification engines, overdrive gearboxes were also listed as factory options. The DB4 Convertible also shared the Saloons Aluminum, Superleggera body construction but now featured a fully lined convertible top, which looked well proportioned in its raised position. Whilst the DB5 is well known as the "James Bond car" we should not forget the DB4 Convertible's role in the film, The Italian Job. In this cult 60s film, Michael Caine's DB4 Convertible, met a nasty end after being pushed over a cliff by a Mafia Bull Dozer!, luckily a good number of these important post war Astons now survive.